Interview with Denial Esports CS:GO coach T.c. Following Denial Esports’ acquisition of the South African CS:GO roster formerly under Bravado Gaming, Julia ‘bish’ Robson spoke with coach Tiaan “T.c” Coertzen to talk about the move to North America and what it means to be coaching this team. Could you give us a short history of the team and how they went from South African superstars to the international scene? The team came together in January 2017, after we didn’t achieve the international results we wanted with the previous lineup. We lost to Rivals Energy Esports in our first online showing, but after that we won the majority of the events for the rest of the year (Mega8, Mettlestate, DGC Masters LAN in July, all three seasons of the ESEA Open ZA, ESL Africa Online Season 1 and 2) excluding RUSH and the ESL Africa Finals. We wanted to make the move to North America because we didn’t have enough opportunities to progress in South Africa and we were pretty much just waiting for Johnny to finish school. What did project destiny represent for the South African scene? We hoped that with Project Destiny we could pave a way for future generations in South Africa that want to pursue esports as a career. Whether it be by inspiring others to follow in our footsteps and realise that it is possible to compete on the international stage if you put in enough work and are willing to make some sacrifices or by attracting more investment into the South African scene so that it may continue to develop. What were the highlights of coaching the team? Thinking back, there are too many highlights to just name one. Some of the best moments were winning our first big tournament at Mettlestate, winning the ESEA NA MDL after barely making playoffs, qualifying for DH Winter and placing 2nd, Qualifying for the Americas minor and winning our first international tournament at DreamHack Mumbai. It’s been an amazing journey. Which international event would you consider a breakthrough for the team and why? Definitely DreamHack Winter 2018. We were the worst ranked team at the tournament and we came in confident and managed to place second and upset some big names along the way. Explain the situation with project destiny and how that lead to joining Denial Esports. I don’t think there is that much to explain and I’ve always been a strong advocate for keeping private matters private. All I have to say is Fallen & co had to leave KaBuM to further their careers, the same way JKS & co. had to leave Vox Eminor to continue theirs. We had a great time under the Bravado Gaming banner and we wouldn’t be where we are today without them, but we are excited to see where our next journey takes us. What is next for the team? Who will replace Dimitri “Detrony” Hadjipaschali’s role in the Denial Esports line-up? 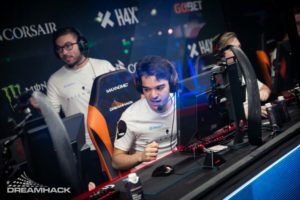 Energy Esports has been kind enough to loan Dominic “Domsterr” Sampaio to us for the WESG finals. By now you might have heard that Ruan “ELUSIVE” van Wyk is also taking a step back and Robby “bLacKpoisoN” Da Loca will be filling in for him. Is there anything the team would like to say to the fans? Thanks to everyone that has supported us this far and we hope you guys can continue cheering for us on our new journey. How EZ is it really for ENCE? Is s1mple wasting his prime years? Do CS:GO players know their enemy?